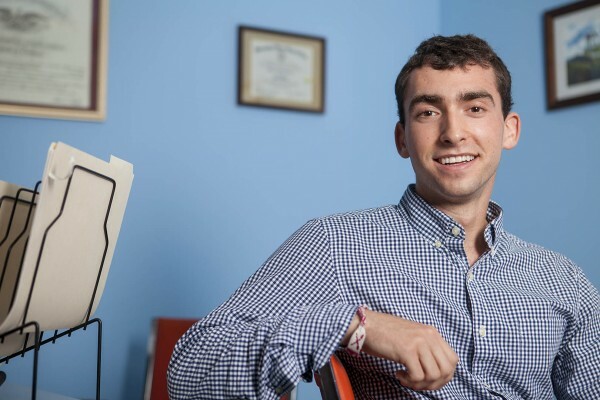 Evan Cooper ’15 spent summer 2014 helping Pine Tree Legal provide legal aid to those who couldn’t afford it. 1. What is Pine Tree Legal? Pine Tree Legal is a nonprofit law firm that provides legal aid to low-income Maine community members. They handle a range of issues around the state, but the Lewiston office largely focuses on housing and tenant rights, though other legal issues are also addressed. One thing I help with is client intake, the first client interview. I get their basic information as well as identify relevant facts about the case and I ask them to provide us their paperwork. I also do client calls — I return messages and answer questions. Another responsibility I have is conducting basic casework, working with the paralegal in the office. For example, we explain the small-claims process to clients, so they can settle security deposit disagreements in court. We also give clients educational materials including things like templates for letters they can use to request their security deposit back. 3. Could you walk me through a small case? For eviction cases we would first check if they have a lease — the law differs in how it treats leased tenants and tenants-at-will. A landlord has to give tenants-at-will 30 days of notice before evicting them unless they have not paid their rent, in which case it’s seven days’ notice. After the notice period is up, the landlord can bring a forcible entry and unlawful detainer action against them, which goes to a hearing in District Court. After asking about the lease we check if they’re current on rent. Late payment’s a common reason for eviction, but sometimes people are evicted despite being current on rent. We have to find out why the tenant is being evicted in order to help defend them in court. The lawyers also carefully review the notice to quit served on them by their landlord to ensure that it adheres to the statutes. 4. How did you get involved? I’ve taken constitutional law classes at Bates with politics professor Stephen Engel, which really sparked my interest in the court system. And a friend of mine worked with Pine Tree during the fall semester of 2013 and really loved it, so she put me in touch with them. 5. How does this relate to your career plans? I took those constitutional law courses that focused on case law in the U.S. Supreme Court, so this is drastically different in scale! I’m on the litigating side of much smaller cases. It’s still interesting: The courts are a fascinating aspect of the U.S. political system. I hoped this would help me decide if I wanted to pursue law school, and I think that it has, this is something I want to continue in the future. 7. Any thoughts on how your liberal arts education impacted your experience? I believe that a liberal arts education tends to help broaden your understanding of other people and the world. It has fostered my desire to get involved with the Lewiston community and work toward the rights of low-income families in Maine, who often have difficult legal situations with their landlords and other matters relating to their lack of resources. They are held back by aspects of the law that prevent them from having as good a chance as other people. There are few legal assistance resources available for such people. Pine Tree is one of a small group of organizations in Maine available to people who can’t afford attorneys for civil matters. An attorney is provided for criminal matters when jail time is possible, but the state doesn’t have to assist in civil disputes — that’s where Pine Tree Legal comes in. 8. Do you have any concluding thoughts you’d like to share? The internship has been a great experience so far. It’s broadened my views of the legal field and fostered my enthusiasm for public interest law.